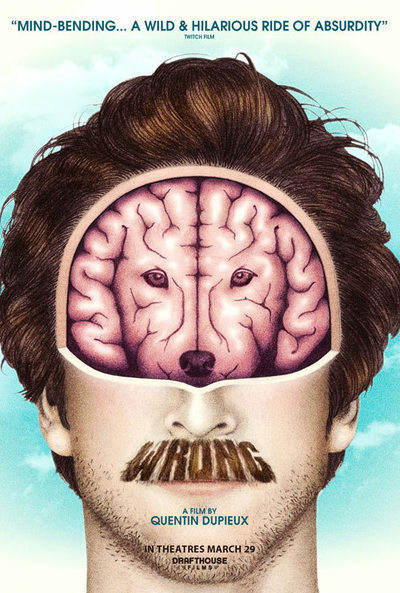 "Wrong" is a surreal shaggy dog story about a loser who wakes up one morning to find that his beloved pooch has disappeared. Composed of skit-like scenes and populated by gimmicky characters, the movie is flimsy, glib, and occasionally pretty funny. The loser (Jack Plotnick, sporting a mustache and a cowlick hairdo) is named Dolph Springer. Though Dolph is unemployed, he can somehow afford a roomy Los Angeles house and a full-time gardener (Eric Judor). However, "Wrong" is a movie where human-to-canine telepathy, indoor rainstorms, and a technology that visualizes the "memories" of feces all exist; perhaps its world also includes French landscapers who will come in five days a week for free. Eventually, Dolph learns that his pet has been abducted by a ring of well-meaning dognappers led by the enigmatic Master Chang (a perversely committed William Fichtner). Half New Age guru, half supervillain, Master Chang is the locus of the movie's best jokes. He may be a menacing criminal mastermind with telepathic abilities, but he's also incompetent and unbearably sentimental. His henchmen abduct pets not for profit, but so that their owners can learn to better appreciate them. He dispenses useless "wisdom" and tells personal stories that reveal more stupidity than cunning (his scarred face, for instance, turns out to be the result of having doused himself with acid on a dare). Of course, Master Chang isn't the only idiot in "Wrong." In fact, the movie has a whole cast of them: Dolph's fidgety neighbor (Regan Burns); a pet detective (Steve Little) who refuses to look at a picture of the dog he's supposed to be looking for; a flighty, bird-brained pizzeria employee (Alexis Dziena) who thinks that Dolph and his gardener are the same person and ends up leaving her husband for him/them. Written, directed, photographed, edited and co-scored by Quentin Dupieux — a man who is the living definition of "Jack of all trades, master of none" — "Wrong" often resembles a student film stretched to feature length. Dupieux's style is efficient but underdeveloped, and leans heavily on rack focus — where the camera dramatically re-focuses from one object to another — as a form of visual punctuation. His music is pleasant but often ill-fitting. His over-use of shallow depth-of-field gives "Wrong" the visual texture of a well-produced web video. What keeps the movie afloat is Dupieux's penchant for absurdist gags — funny, surreal conceits and concepts. Dolph's former workplace — where he still shows up despite having been fired three months ago — is constantly experiencing a torrential indoor downpour. His neighbor talks about jogging like a junkie being confronted about his heroin addiction. Both the gardener and the pizzeria employee struggle with basic object recognition. Dupieux's previous feature was "Rubber" (2010), a B-movie send-up about a sentient tire with telekinetic abilities. "Wrong" dispenses with the earlier film's over-the-top gore and heady meta-movie hijinks — characters addressing the viewer, an on-screen "audience" observing the action — in favor of unpretentious comedy and non-confrontational cutesiness. This makes "Wrong" more palatable — but also blander. What "Rubber" lacked in pay-off, it made up for with personality. While "Wrong" exhibits a well-developed (though hardly original) comic sensibility, its flat style means that no gag, however weird, has any bite. If the film had any depth, Dupieux's humor could be subversive. His favorite targets, after all, are authority figures — cops, firemen, employers. The absurd can serve as a commentary on reality; without a firm grounding, however, all it can be is amusingly weird. In "Wrong," Dupieux opts for "shallow" laughs — jokes without characters, subtext, or a tinge of truth. His gags are gags and nothing more.